In January of 2018, we had our official launch into the Field & Stream store here in Kalamazoo, MI. WHAAAAT?! The amount of people that showed up was incredible, so incredible that we sold out within the first few hours. But as you know.. Matt always has tricks up his sleeve. Luckily he printed extras of everything so that everybody left with some sort of Section gear to add to their collection.. It was incredible! 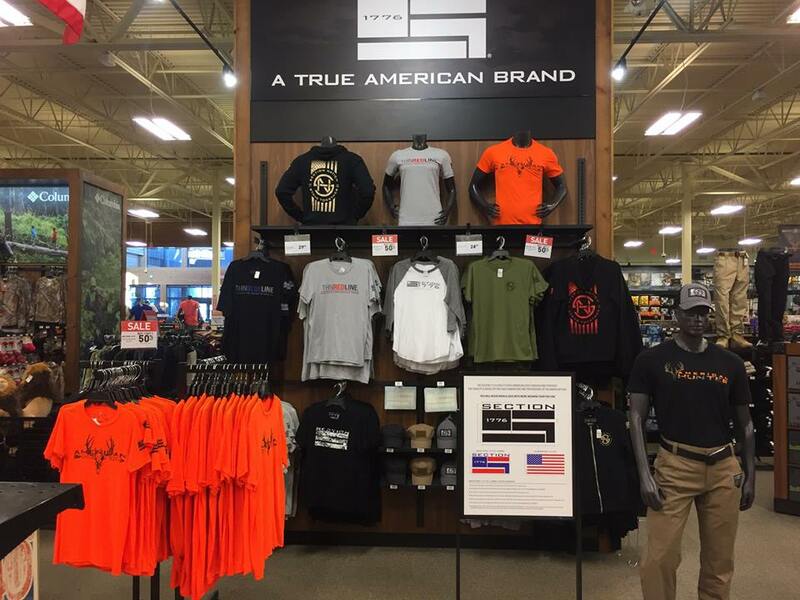 Currently, we are excited to say as of October we have expanded into 10+ Field & Stream stores nationwide. The Section Nation is growing, coast to coast! In the beginning days of July, Section 1776 was contacted in regards to a fellow veteran named Heath. Heath was diagnosed with gien-barre syndrome, leaving him paralyzed with no known cure. Long story short, Heath was in need of a vehicle that was capable of utilizing a lift for his motorized chair, as his current vehicle reached its lifespan. With his family of four children, there wasn't much time to waste. A video was created to help get the word out, and within a week the Section Nation and partners had raised $10,000+ to purchase him & his family a new vehicle and get them mobile again, along with the Section Collection covering his first 6 months of car insurance and Auto Maxx stepping up to cover the rest on an amazing vehicle! Throughout 2018, Section had the privilege of not only impacting, but also being acknowledged by hundreds of children to young adults. From Matthew spending a day inspiring children at Van Buren Youth Camp about what it means to be American, to inspiring a classroom of children to take the initiative on rounding up some generous gifts for their local police department in thanks for their efforts, to being acknowledged by the students at Van Buren Technology Center (Vo-Tech) with some amazing pieces of art. It has truly been a privilege to have an everlasting impact on today's future leaders and showing them what kind of an impact they can have on their community! In 2018 we lost not only a local Marine, but a long time supporter of Section 1776. Physically home but never leaving the battle, Patrick Werme died by his own hand on July 3rd, 2018. This tragedy shook the entire community, bringing the battle that enslaves Veterans across the whole country close to home. To do our part in helping fight the battle, and with permission from Patrick’s family we did a collaboration with Mission 22 to help bring awareness to the Veteran Suicide awareness epidemic. We released a special edition of our “Unconquered” shirt in red, symbolic of the Remember Everyone Deployed (R.E.D.) Friday. In this collaboration, Section 1776 was able to donate just shy of $5,000 to Mission 22 to help promote the awareness of this epidemic. We are honored to have been able to do this, and it could not have been possible without the help of the Section Nation & Mission 22. Each year, we throw our annual Section Collection around the month of October. This event in years past has been huge, providing meals and clothing for local Veterans and their families. This year was nothing short of incredible to say the least! We teamed up with Kalamazoo Mortgage, Pitt Ohio and Modern Woodman to throw on an awesome event. As the Collection was going on, we had an amazing chilli cook-off as well to fight the wet & cold Michigan fall weather! At the end of the day, we collected over 17 pallets of food and clothing, which amounted to about a whole years supply of meals for deserving Veterans at Silver Star Apartment Complex in Battle Creek. It was a huge success & we could not be more thankful for the community for coming out, donating good & making it a fun event! If you thought 2018 was a big year, just wait til you hear this. On July 24th, we paired up with Kalamazoo Mortgage for the 4th annual Hero Salute golf outing at Gull Lake View Golf Club. In total, we had a turnout of about 350 golfers and dozens of items that were raffled off, ranging from a set of custom Section 1776 bag toss boards to a fully custom Glock 17. All of the proceeds from the raffle went towards local police/fire rescue/Veteran charities, totalling nearly $50,000…. Yes, you ready that right! It was a hands down amazing event and could not have been done if it weren't for everybody involved, which was an extensive list in and of itself. It is truly amazing to see the community come together for an event such as this. 2019 will be even bigger & better!